That’s one of five locations PBOT wants to hear feedback on as they decide whether or not to make all the project elements permanent. Other elements of this project they want to hear about are the improved crossing at SE Ladd and Clay, the semi-diverter at 26th and Harrison, the diverters at 30th, and the restriping at 42nd. If you ride this ride and have input on how it’s working, please take the survey and share your thoughts with the city. – Emily Guise, BikeLoudPDX and @Eguise on Twitter. Input submitted! I had to expand the main comment box to get all my points in, but I didn’t hit the upper limit on characters at least. Yes, I wish I could comment on more than one aspect of the project! It’s odd that it’s set up that way. I tried to take it again to comment on a different diverter, but the survey wouldn’t let me take it twice. Thank you, Emily, for posting this. 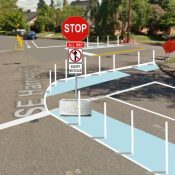 The survey asks respondents to choose only one aspect of the LHL project, say the diverter at 30th and Harrison/Lincoln, or the one at 50th and Lincoln, or new signage, to comment on. I encourage people to focus on the latest piece of the project, which is the 50th and Lincoln diverter. Please ride through it and note any problems you see with the current design and your experience there. As many of you may remember, this intersection had the most vocal and aggressive pushback of the entire project. 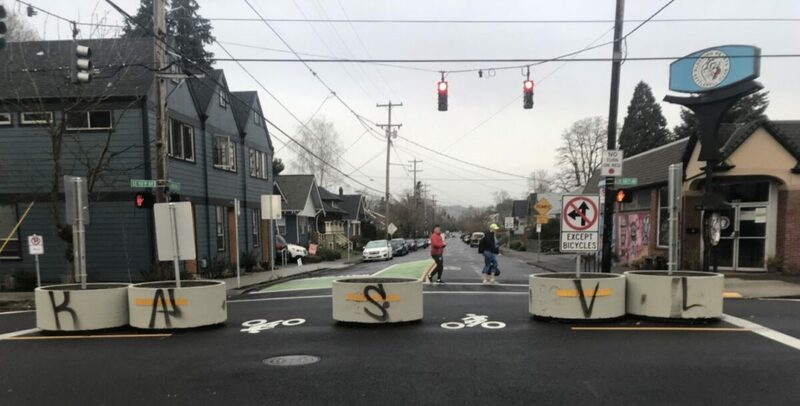 While we in the Safer Lincoln group are thrilled to finally have a diverter in place at 50th, we are seeing potential safety problems with the current configuration (which was changed to accommodate an ADA parking space). 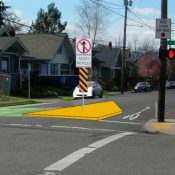 We’d love to have further feedback go to PBOT from those who have used this diverter. The curbside ADA parking space is located in the westbound lane where parking was scheduled to be removed to allow for a green bike lane to the left of right-turning cars. Now they have painted that lane across the center line, which lines it up head-on with the oncoming eastbound bike traffic. Even worse, it directs cyclists into the oncoming lane in conflict with northbound motor vehicles on 50th Ave. when they turn right onto Lincoln. We want to accommodate Americans With Disabilities, but not at the expense of creating new ones. 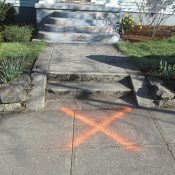 A simple fix has been suggested – move the ADA spot about 20 feet to the east. I think we should push for it. Agreed. This is what I commented on in the survey. That design change makes it worse for bicyclists. Thank you Emily for notifying us about the survey. I’ve really been enjoying the change in traffic around 50th. I’ve had 0 incidents with close passes or aggressive driving since this has gone in. Before they were installed every eastbound rush hour trip involved at least one dangerous pass or impatient driver following too closely. You don’t have to click one of the options in the first question. I didn’t, and just kept going in the general comments area. More work for whoever sorts the replies I suppose, but it worked for me. You might also try clearing cookies if you want to go at it again. The gaps between concrete planters in the photo above looks adequate, but well less than 7′ 10″… Curious. They feel spacious, much more so than Ankeny’s temporary solution. Try it. Or even better, measure it. Ankeny has a temporary solution? It certainly looks permanent. It was temporary; but as of a month or two ago it is now permanent. The gaps look small but don’t feel that way when biking through them, IMO. There are no 7′ 10″ gaps at Ankeny. I measured it. Why so coy? Why not just tell us how wide they are? I walked the Eastbound one off at 7′, and someone else measured the Westbound one at 7’10”. They are 7 feet as specified. Someone else lied. We had a considerable back and forth about this back when the facility went in. I continue to be interested in PBOT explaining why this was the width specified when a large number of autos can fit between those curbs – and if you look at the tire marks left on those curbs it seems to not be lost on the drivers of those autos. What gives? You should visit it again. 7 feet is safer for people biking that wobble and those pulling trailers. 6 foot is the minimum width and 6 ft 6 inches is the standard (2 m) width for a bike lane. Those widths are without any adjacent structures that an errant cyclist could strike. Added space is called shy distance. In this case a small six inches more than a standard width bike lane. Please! I *drove* through it yesterday. You still haven’t explained why the width of a bike lane is relevant, should be the guide here. This is not a bike lane but a choke point meant to thwart car passage. I have more bike trailers than I can count. I don’t think I’ve carried anything wider than a stack of 4×8 sheet rock. The numbers you are trotting out here are to me utterly fanciful. I should think most people could understand from my description that safety of cyclists is the point of the standard. Not convinced. Having a diverter gap so wide that most/many cars can pass through doesn’t improve safety for cyclists in any way that makes sense to me. The point here surely is to find a width, devise a standard that accommodates bicycles but dis-accommodates cars. Ever wider (and even you can probably agree that both bike lane and diverter gap widths have been growing ever wider around here) is surely not a winning formula when the goal is to arbitrate between two competing parameters. Submitted my positive feedback for the diverter at SE 50th. When did it go in? I’m so excited to finally see this in place!!! Great, thanks Adam! 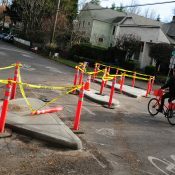 The temporary diverter at SE 50th (and the other permanent ones) went in this summer. Due to the recent re-paving of 50th and some local pushback, the 50th was changed to temporary status with re-evaluation after about six months. Just to clarify, the diverter at 50th went in just a month or two ago, not last summer. The barrels are a temporary measure, and allow for tweaking and corrections of the layout before the final one. Traffic measurements will be taken at some point before the permanent installation. My understanding is that there is little traffic enforcement for a while as people get used to the changes, my anecdotal observation in the first days was that many drivers parked squarely in the bike boxes before turning right onto 50th during the red light (with a new sign expressely forbidding that). While I don’t like that, I think there is room to let confusion die down before enforcement begins. It’s a dry day out today, if anybody has free time this afternoon it would be great to include this diverter on your outing today and register your observations with PBOT. And of course, regular Lincoln commuters have great expertise on this topic. Oops, you’re right, Andrea! Thanks for correcting my mixed up timeline. IMO, the temporary diverter is an unnecessary concession to a small number of homeowners who made a scene at an open house. PBOT has plenty of data showing that diverters are effective and do not markedly increase traffic on neighboring streets. I walk, run, or bike through the intersection several times a day. I agree with Andrea about cars encroaching in the green box and RToR. Also have noticed of westbound on Lincoln drivers see the new diverter and turn into the parking area of the dark grey townhomes thinking they can get to southbound 50th that way. Finally, at least once a week, I see someone turn left from Lincoln onto 50th (usually eastbound to northbound) by waiting until there is nobody in the southbound lane and doing a wrong-way move. Enforcement, please? Even if it is just educational/warnings. As a neighbor of the 50th diverter, I have to say the impact on the neighborhood is wonderful, better than anticipated! Really great stuff. Even the complainers have to admit, it’s a win for everyone.